When you look at a beautiful floor, what you see is tile, wood, carpet, laminate or LVT; what you don’t see is the expert installation that is the framework for the flooring materials. If the same products were installed in a slipshod, messy manner, that’s all you would notice, the beautiful materials lost amid a muddle of mistakes. As a customer of Westbrook Floor Covering, our flooring installation service makes sure this will never happen with a floor you purchase from Westbrook. We know that it takes a lot of planning and time to select a floor that resonates with you and your home –not to mention the significant financial commitment you make to the floor. 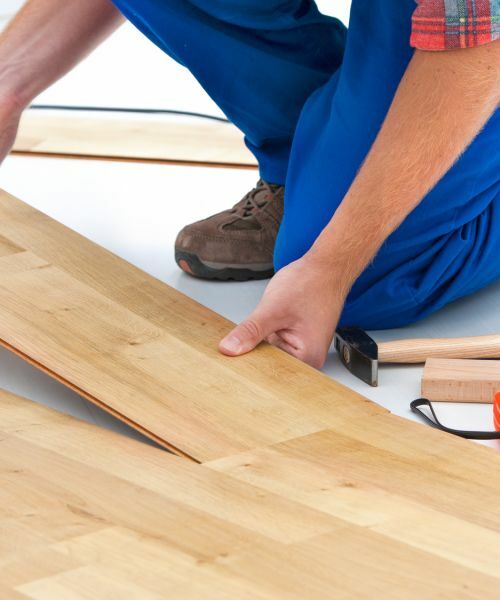 Westbrook Floor Covering’s customers in Old Saybrook, Clinton and Madison can be confident that the crew who installs your flooring are licensed, trained professionals. We are fortunate to have installers who are experts and specialists. If your installation involves carpeting a staircase with landing and turns, we have an installer who fits carpeting like fine upholstery ... and he will be on your job! We match the requirements of your installation with a crew with the specific skills needed. Westbrook Floor Covering’s installation crews arrive on time and ready to work. Our management monitors the installation to make sure the job proceeds on track. When the installers are done, we will walk through the job with you for approval. If we need to make adjustments, they will be done immediately. Only when you are completely satisfied do we consider your flooring installation finished. Stop by our showroom in Westbrook, Connecticut to ask about flooring options and our professional installation services today.